According to the Supplementary List for Monday, 07th July, 2014, three new judges will be presiding in the Supreme Court. Though no formal notice is issued about the swearing in ceremony, the three blanks left for three judges clearly point towards the new Judges assuming their role in the Supreme Court. The first bench will comprise of Chief Justice of India R.M. Lodha, Justice Kurian Joseph and one of the new judges. The second judge will preside with Justice H.L. Dattu and the third with Justice T.S. 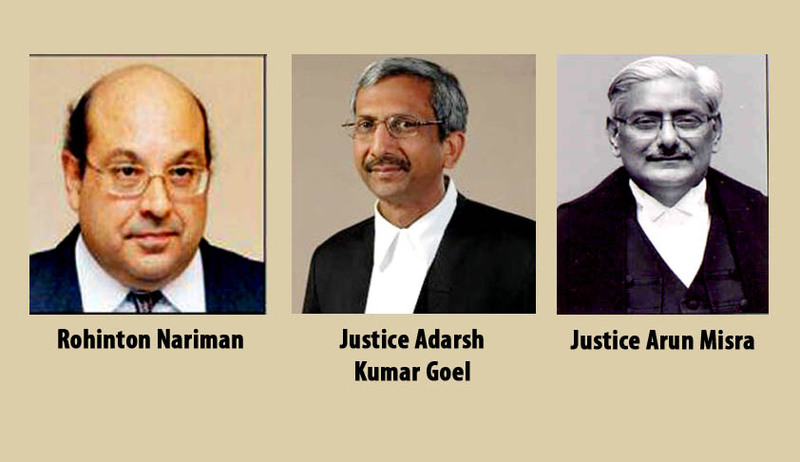 Thakur, the three senior most Judges. Senior Advocate Rohinton Nariman and the Chief Justices of the Calcutta and Orissa High Courts, Arun Mishra and Adarsh Kumar Goel respectively, will be joining three Benches in the apex court. Their names received Presidential assent a few days ago. The names were forwarded to the President by the Law Ministry a few days ago even as it turned down the elevation of the former Solicitor-General of India, Gopal Subramanium, who was among the four names recommended by the Supreme Court collegium last month. Refer the Supplementary list here.